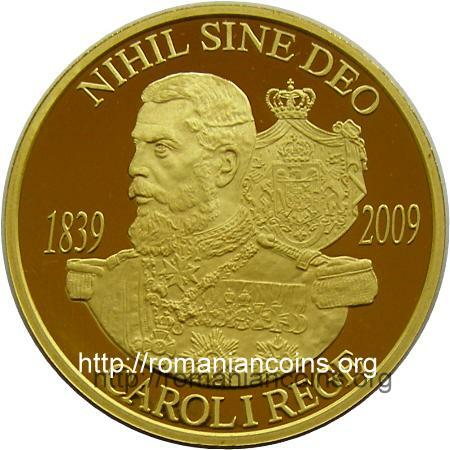 Obverse: coat of arms of Romania, year 2009, face value "500 LEI", ROMANIA, an image of Peleş Castle from Sinaia insede a laurel wreath Reverse: bust of king Carol I, coat of arms of the Kingdom of Romania (model 1921, from after the Great Union of 1918), above inscription "NIHIL SINE DEO" meaning "NOTHING WITHOUT GOD" in Latin, years 1839 and 2009, below inscription "CAROL I REGE" meaning "CAROL I KING"
Behnd the king's bust lies the coat of arms of Great Romania, adopted after the reign of king Carol I, in 1921. 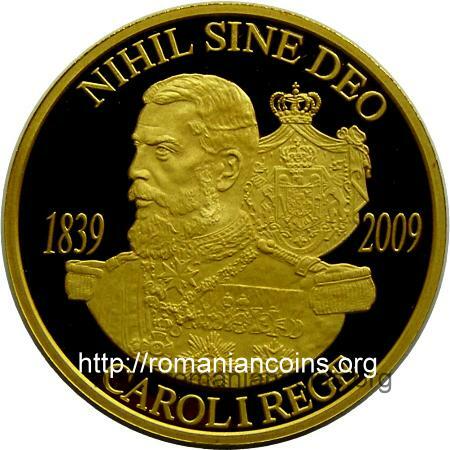 Given the subject of the coin the coat of arms of small Romania, adopted in 1872, would have suited better. 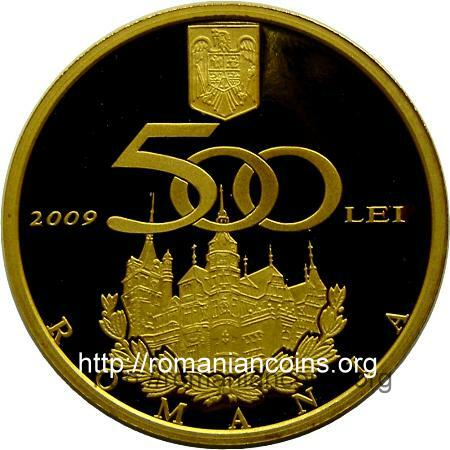 The same composition was used for the design of the 100 lei 2011 - Proclamation of the Kingdom of Romania - 130 Years. The peculiarity related to the version of the coat of arms was corrected at the coin from 2011.